The AGW is delighted to be organizing this live auction of works by artist and long-term AGW director-curator, Kenneth Saltmarche, along with a selection of artworks from the private collection of Kenneth and wife Judith Saltmarche. 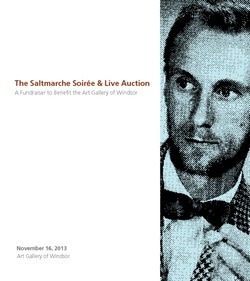 This unique fundraising opportunity has been made possible thanks to the generosity of the Saltmarche family, who have remained the custodians of these works for more than a decade and now wish to share them with the community. We appreciate their continued support of the Gallery. It is a rare occasion to have an event of this nature given the paucity of historical and modern artworks commercially available to collectors in this region, and which also contributes to sharing important collecting histories in Windsor-Essex. For many decades, Judith and Kenneth Saltmarche came to be known as the driving force behind the AGW, and it is to their credit that we have such a fine gallery and collection. This event pays homage to that legacy, honouring him as artist and them both as collectors, while providing occasion to remember their multiple roles in this community. He was an artist, arts administrator, cultural leader and art critic, and she supported him throughout these lifelong accomplishments to facilitate Gallery successes and steward day-to-day family life as parents to twin sons Noel and David and their families. We are also indebted to the expertise of Waddington's Fine Art of Toronto, whose experience has been invaluable to staging this event. Our thanks are also extended to hosts Pam and John Rodzik of Windsor, whose support of this event has been steadfast from the outset and has made it possible for a full evening event to benefit the Gallery.